Understanding the means tested care fee is quite difficult but necessary because it’s one of the most important fees you’ll have to deal with when moving your parent into aged care. This is among the fees charged when entering an aged care home. The fee caters for your loved one’s day to day care costs in the home. Other fees that you will be required to pay before your parent can enter a nursing home will include a basic daily fee, accommodation costs and more. When you pay the means tested fee this goes towards the cost of care for the individual moving into a home. This fee caters for day‑to‑day needs while at the home such as meals, cleaning, laundry, heating etc. The Department of Human Services will calculate the amount you will pay for the aged care means test fee based on your financial situation. They take into account your combined income and assets as well as the cost of your care. You are required to finish paying your means tested fees within 120 days from the time your parent enters the aged care home. However, there are are annual and lifetime means tested care fee limits that an individual can be asked to pay. Once you reach these caps, you cannot be asked to pay any more of these fees. Some people are also not required to pay the means tested fee and the Australian Government pays the full cost of their care. To find out if your parent qualifies for such an exemption consult an expert financial adviser who will do aged care means test assessments for you and advice you accordingly. They can also be very helpful to make sure you’re doing the paperwork right. This will help determine whether you’re eligible for any Australian Government assistance and make sure that you don’t pay more fees than you need to. Completing the correct combined income and assets assessment form will ensure that you receive assistance from the Government if you qualify for it. Without this form, you may end up paying the full means tested care fee. 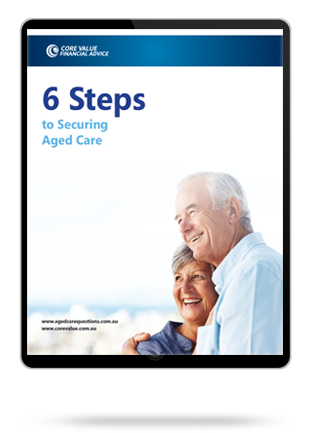 Understanding all the costs and fees involved with aged care can be complicated. A financial adviser can help. If you’re considering moving your loved one into aged care, the team at Core Value will help you understand how the means tested care fee relates to your financial situation and needs. We will also help you know which costs you should be paying and create payment solutions that will not leave you struggling financially. We’ll advice you on the assets you need sell or keep and walk through estate planning and investment complexities. Over the years, we have managed to assist hundreds of clients maximise Centrelink and DVA support, significantly minimising their aged care fees. This way you never pay more than what you need to. By employing clever strategies to reduce the means tested care fee and maximising the benefits owed to you we can save you thousands of dollars every year. Give us a call on 1300 944 011 to schedule a free consultation with an aged care specialist for the best aged care means test advice.